If you have an iPhone, then you know how awesome it is to have a camera available when and wherever you need one. A picture is great, but video is better. The cameras on the latest iPhones can capture some great video. The problem with most camera is that it normally only catches one field of view. What if your iPhone could catch everything around you? That's right, you can capture 360º video on your iPhone with the help of a little gadget called Dot. Dot lets your iPhone capture immersive, fully navigable, panoramic video in real-time - and share with friends on your phone, as well as on Facebook and Twitter, or streamed online using our awesome panoramic video web platform and player. It’s a stylish, durable and downright pocketable. So you can take it with you anywhere. 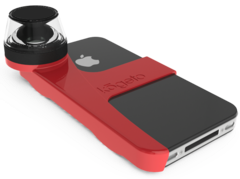 Dot is a 360º (panoramic) lens attachment and an app for the iPhone 4. Snap Dot onto your iPhone 4, download the free Looker app, and instantly record fully immersive 360° videos right on your iPhone. Going to a concert? You can record the show and the audience. Heading out on a road trip? Leave Dot on the dashboard and record your highway adventures. No matter what you're recording, Dot sees everything! Dot was made possible with funding by users at Kickstarter. Kickstarter had made many great iPad and iPhone gadget come in existence; if you haven't heard of them or haven't visited, please do so and search for iPad or iPhone to see what is going on there. Kogeto is the maker of this incredible device. Check out some user videos. Dot is available in black, cherry red, green and pink. Dot retails for $79.00 USD. Dot is available for pre-sale and expected to ship in late October 2011.